This node creates a terrain from an image file. The image is transformed into gray levels, each pixel having a value between 0 and 1. The generated terrain has the resolution of the image as its size, and the height of each point depends on its gray level and the scale of the heights (vertices with a 0 value will have their height set to the min value, and vertices with a 1 value will have their height set to the max value). To add a node, right click in the Graph Editor and select Create Node > Import > Import terrain from file. Every heightmap used for a terrain may contain colors or an alpha channel. Both are converted into gray scale values. Quad size: Sets the size of the terrain quads. 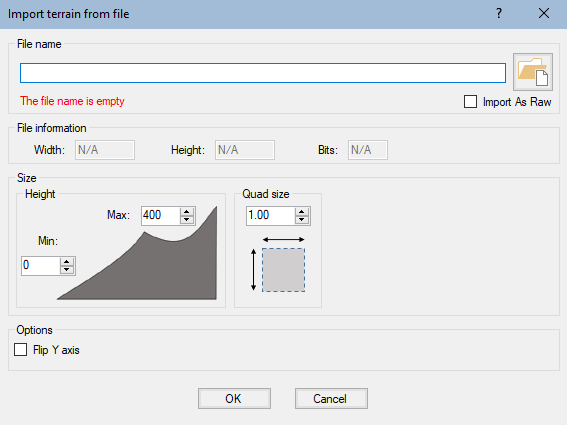 File information: Sets the Width, Height, and Bits of the terrain. Height: Sets the minimum and maximum height of the terrain. Flip Y axis: Check the box to flip the terrain around the Y axis.